This blog examines brands of food, cosmetics and cleaning products which were locally made and advertised throughout WWII. Thomas Hedley & Company Ltd was a major British Company, based in Newcastle, that manufactured soaps. 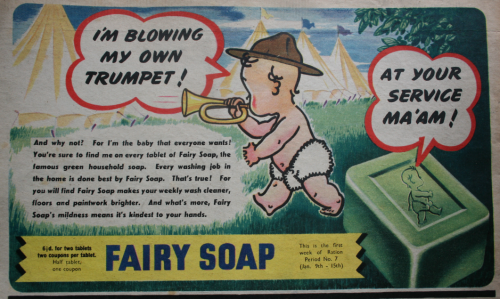 Two of its most well-known products are Fairy and Oxydol Soap, which were key household products during WWII. During wartime, when many things were rationed, advertisements claimed that these products were multipurpose and longer lasting than other products. 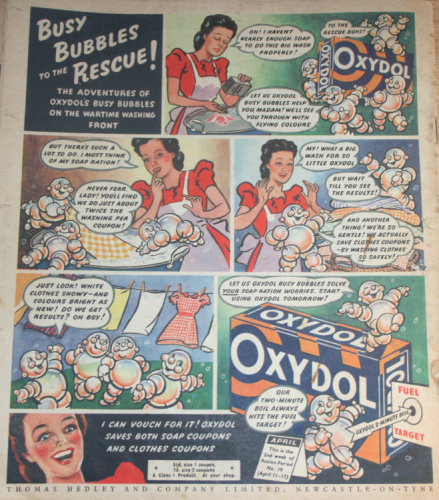 It was even claimed that Oxydol had the ability to do almost twice the washing per coupon, a bold claim, which was popular with consumers. Advert from the back of Woman Magazine, week ending 17 April 1943, Tyne & Wear Archives & Museums. Another trusted household name, produced by Thomas Hedley & Company Ltd, was Fairy Soap. ‘The famous green household soap’ boasted about its ability to make floors and paintwork brighter. 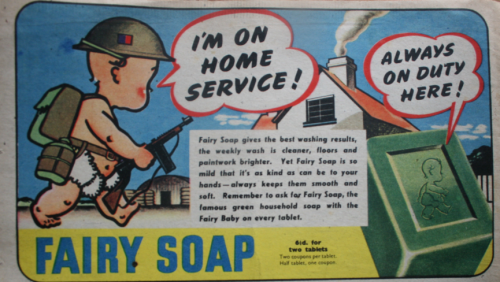 Despite being tough on stains, this product also claimed to be gentle on skin, being ‘kind as can be to your hands.’ Adverts for Fairy Soap took on the military theme during the war often using slogans such as ‘I’m on home service’ and ‘at your service Ma’am’ two examples of which are below. Advert from the back of Woman Magazine, week ending 25 March 1944, Tyne & Wear Archives & Museums. Advert from the back of Woman Magazine, week ending 15 Jan 1944, Tyne & Wear Archives & Museums. Advert for Andrews Liver Salt from the back of Woman Magazine, week ending 10 April 1943. Tyne & Wear Archives & Museums. Shop Window Display of Andrews Liver Salt. Courtesy of Tyne & Wear Archives. Andrews was manufactured and sold near and far by Scott & Turner Ltd. 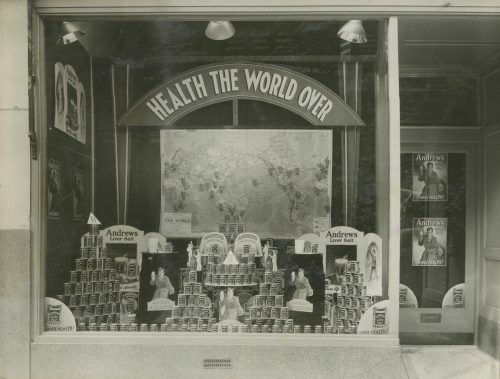 This picture, which can be dated to around 1934 (or earlier), shows a window display of Andrews Liver Salt. It was by the time of WWII already a world known brand. 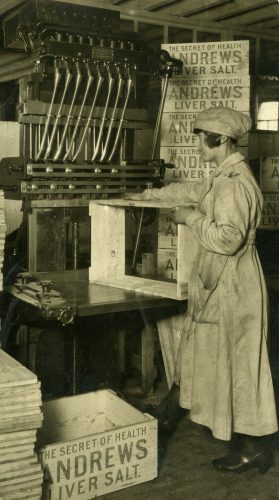 Photograph of a woman working in a factory, making boxes for Andrews Liver Salt. Courtesy of Tyne & Wear Archives. As a young woman born in Newcastle, I can’t help but feel a great sense of pride in what was once very local industry, one that produced brands which are still going strong. Though time has passed, we can be assured that these products have helped put Newcastle on the map as the production place for many great products that saw us not only through the war, but are still used to this very day.